Born: September 1, 1840 in Harwich Ma. 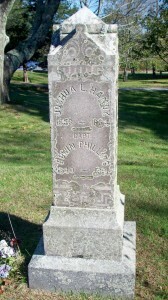 Died: April 10, 1891 in Bourne Ma. at 51 yrs. 1. Abby L. Phillips; (1860 – ? ); No further information. 2. Edwin E. Phillips; (July 16, 1862 – ? ); Married Ruth Hobson. 3. Albert T. Phillips; (1867 – ? ); No further information. To: Annie DeWitt Bourne Handy; (1853 – 1932) (Benjamin Franklin Bourne & Elizabeth Wheaton Lincoln); Annie married (1) Joshua Lewis Handy (1853 – 1884) (Joshua Handy, Capt. & Dorothy Clifton (Hathaway)) in Sandwich Ma. on November 6, 1878.